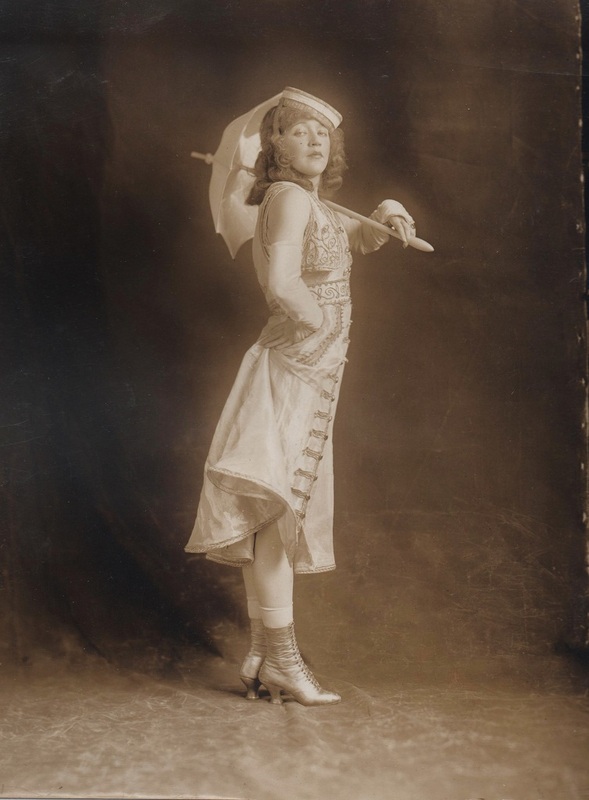 Mae Murray was a dancer. First and foremost. The ignorance or avoidance of that simple fact has obscured who she was and her place in the popular arts of the 20th century. She was one of the oddest of the major stars of early, silent film, not because of her personality — which was not inordinately odd by the standards of the professional stage of that era. Mae Murray was odd because she wasn’t an actor, she was a professional dancer who became a star of silent film. She wasn’t unique in that regard. She aided and encouraged her close friend, Rudolph Valentino, another New York cabaret dancer, to follow her into the movies. But unlike Valentino, dance seemed part of her genetic makeup. She never stopped being a dancer throughout her career, though technically she never again danced professionally after she entered films in 1916. She became a star of the movies without having significant experience as an actor, on stage or on film. That also doesn’t make her unique. 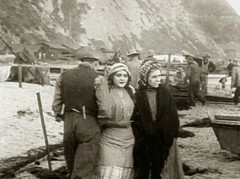 Charlie Chaplin and Mack Sennett “discovered” Edna Purviance and Gloria Swanson, respectively, as “civilians” (office clerks) and both women became stars. 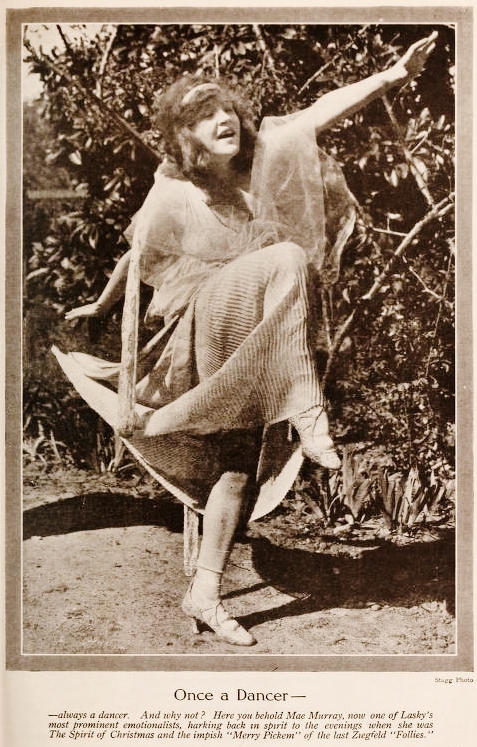 Blanche Sweet was a trained dancer (unlike Murray) for whom dancing was also her first love, and she made film acting her career choice for financial as much as artistic reasons. Stardom wasn’t the point for Sweet. It was for Mae Murray, and it was the reason she stayed in films after finding her initial experience with them awful. Murray hated the restrictions forced upon her by the “movies.” She wasn’t used to staying between the lines on a movie set. She detested the artificial boundaries imposed by the film camera. Once she formed her own production company and negotiated distribution deals for her films, she was freer to make dance a part of her movies, in some cases a large part. In a sense, she was born two decades too soon. Silent film, even with orchestral accompaniment, was not hospitable to the musical, and Murray had grown up as a professional in the musical-comedy-dance revues of the early part of the 20th century. And she kept dancing in her movies, much to the dismay of film critics expecting her to stand still and act for the camera. Mae Murray was already something of a star before she entered motion pictures, a star in the limited world of New York nightclubs and cabarets clustered around Broadway. More importantly, she was a star in the unlimited world of her own imagination. 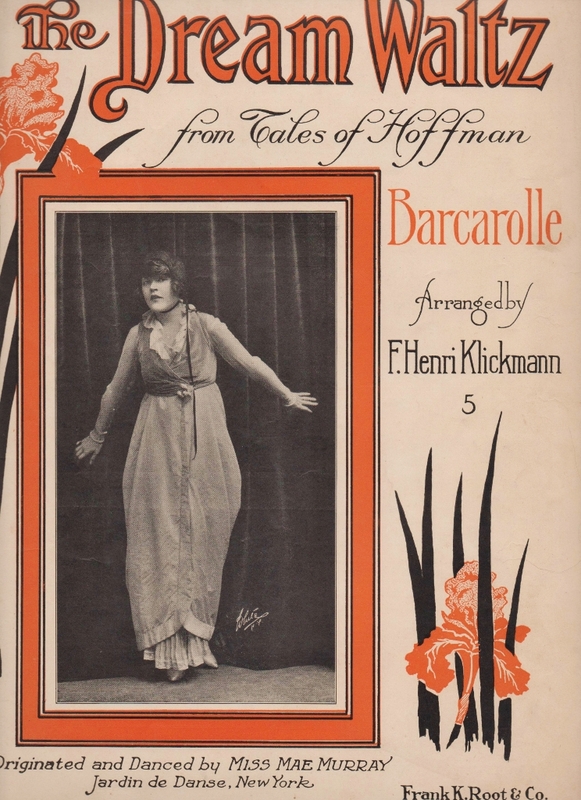 She had just begun to approach the point where the stardom in her mind became a reality — she was a major success in the latest Florenz Ziegfeld show, The Follies of 1915. This was the stardom of which she had dreamt. Then appeared Adolph Zukor, and the movies beckoned. 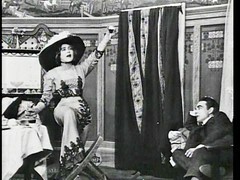 Above and Below, Mae Murray’s dance act at “Jardin de Danse,” a rooftop cabaret at the New York Theatre on Broadway at 44th Street, was used to promote songs by New York music publishing houses. Murray had studied the latest cabaret dances during a two week trip to Paris in 1913, learning the moves to the maxixe, among others. 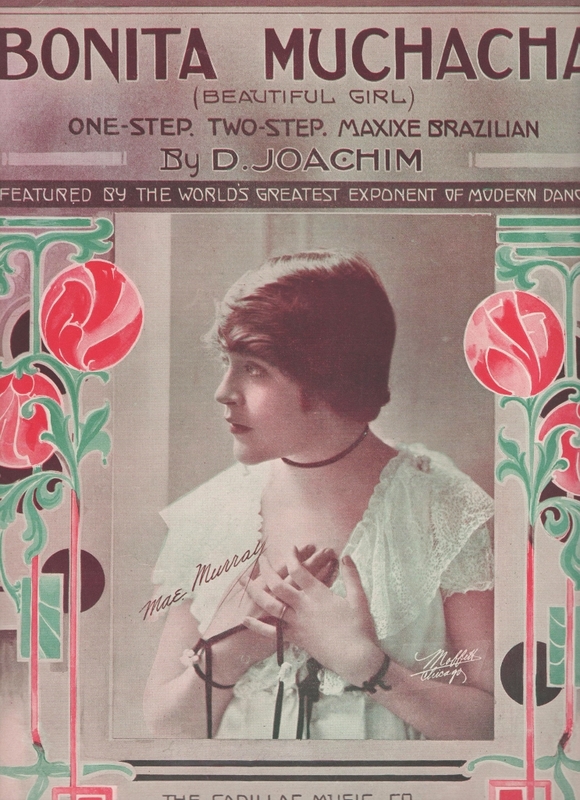 According to these music publishers, at least, she was “The World’s Greatest Exponent of Modern Dance.” These two examples from 1914 also show how popular music was introduced to the music-buying public with song sheets in the period just before recorded music became widely available. It was an era in which every household able to afford a piano had one. Mae Murray was “discovered” by the movie industry (it wasn’t yet universally referred to as Hollywood) in late 1915. At the time, she gave her year of birth as 1892, meaning that she was 23. 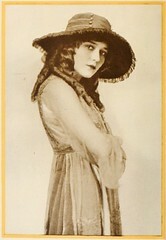 As Photoplay Magazine reported in 1916, she was “in the April” of her years. Wrong. She was over thirty. It was only one of many deceptions Murray played not only with the press, but with virtually everyone who knew her. In reality no one knew her. 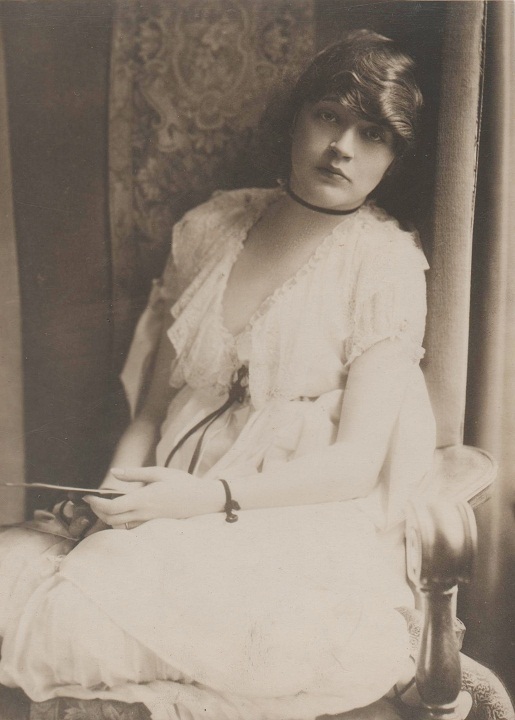 In addition to being one of the oddest of the early film stars, she was also one of the most secretive. So daunting was the task of unearthing her past, that the only biography written and published within her lifetime, Jane Ardmore’s The Self-Enchanted (McGraw-Hill, 1959), became legendary in its own right for being completely bereft of dates, and therefore a less-than-reliable account of her life. Murray famously withheld all information that would have allowed Ardmore to pin down rather important facts such as the date of her birth. Much of what she did provide were the fantasies that she had been telling for so long, they were assumed to have at least some basis in fact: her parents were Irish, she was born in Portsmouth, Virginia, she lived with her grandmother until she ran away to New York to become a dancer. None of these were remotely true. Not surprisingly, every attempt after Ardmore’s biography wound up hitting a brick wall of obfuscation. Finally, in 2010, biographer Michael Ankerich broke through this wall and began to uncover some amazing truths about the real life of Mae Murray. She had two brothers no one had known about; her father died an alcoholic when she was a child; she severed all ties with her own mother completely when she was a teenager; her son, born in the late 1920s, was still alive and for the first time agreed to be interviewed about his mother. Mae Murray was a native New Yorker of German descent, born on Broome Street in the Lower East Side of Manhattan, and she was significantly older than she had admitted, something long suspected but never before proven. The investigative work by Mr. Ankerich changed all that, and gave us the first reliable biography, Mae Murray: the Girl with the Bee-Stung Lips (University Press of Kentucky, 2012), the subtitle being a nickname given Murray by the movie press at the peak of her popularity. It is a meticulously researched biography, and I suspect it will in all likelihood be the last, as well. 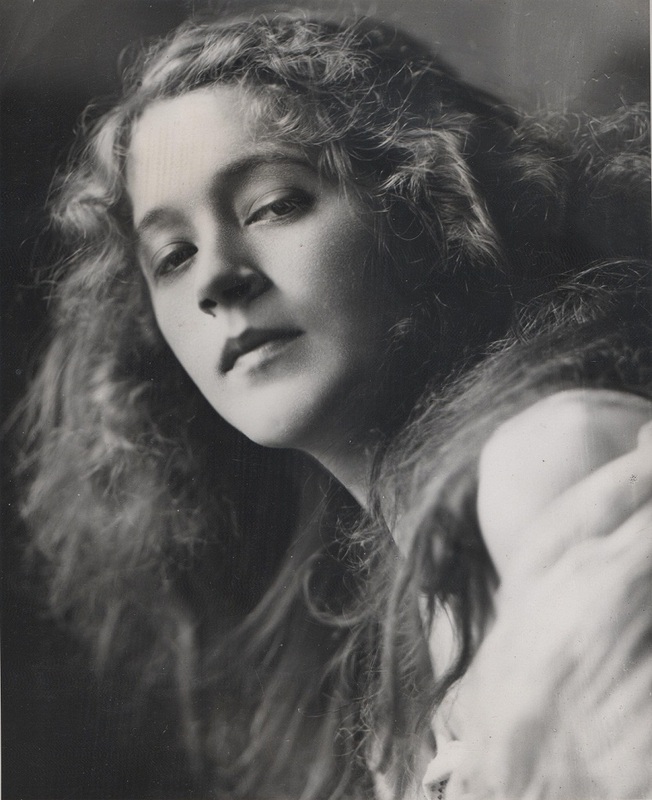 Mae Murray was born Anna Mary Koenig on the Lower East Side of Manhattan, May 10, 1885. She began her career as a dancer in early 20th century musical revues and musical comedies. She was chosen by producer Florenz Ziegfeld for an ensemble role in his Follies of 1908 and 1909. By 1910 she was appearing in minor roles in musical comedies, the most notable being Her Little Highness (1913), a musical comedy vehicle for Hungarian sensation Mitzi Hajos. Mae Murray made Page 2 of The New York Dramatic Mirror, November 19, 1913, as one of the “Favorites of the Footlights.” Murray was performing her dance act at the rooftop “Jardin de Danse” at the New York Theatre, Broadway & 44th Street. Working Vaudeville from 1912-15 as a cabaret dance act with male partners, Murray attracted the attention of Manhattan nightclub investors looking to capitalize on the trend of dancing cafe/clubs. They bankrolled her effort to reopen a closed nightclub, “Sans Souci,” as “Mae Murray’s Sans Souci” in early 1915. The new club became a success, but Murray got an unexpected break when she was asked by Irving Berlin and Vernon Castle to substitute for Castle’s ill wife Irene in their hit Broadway show, Watch Your Step. 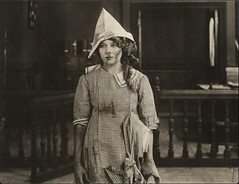 This was followed by a featured role in Ziegfeld’s Follies of 1915 in which she stood out in several sketches including a spoof of Mary Pickford as “Merry Pick’em.” After the Follies closed, movie producer Adolph Zukor approached her, offering a contract with Famous Players, and Mae Murray began her film career. 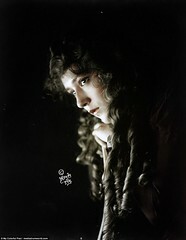 She reluctantly relocated to Los Angeles in 1916, and made five feature films in her first year. 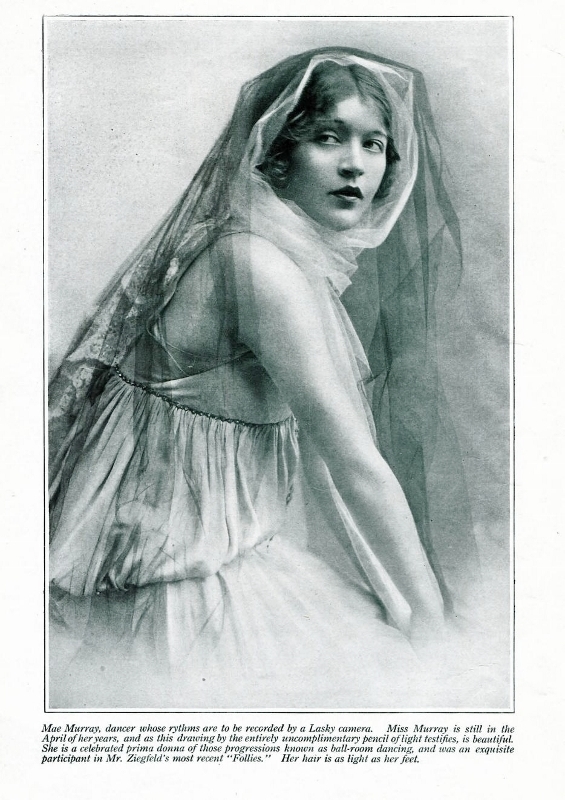 Photoplay Magazine in March of 1916 referred to the newly discovered star Mae Murray as being “still in the April of her years.” She was actually 30. 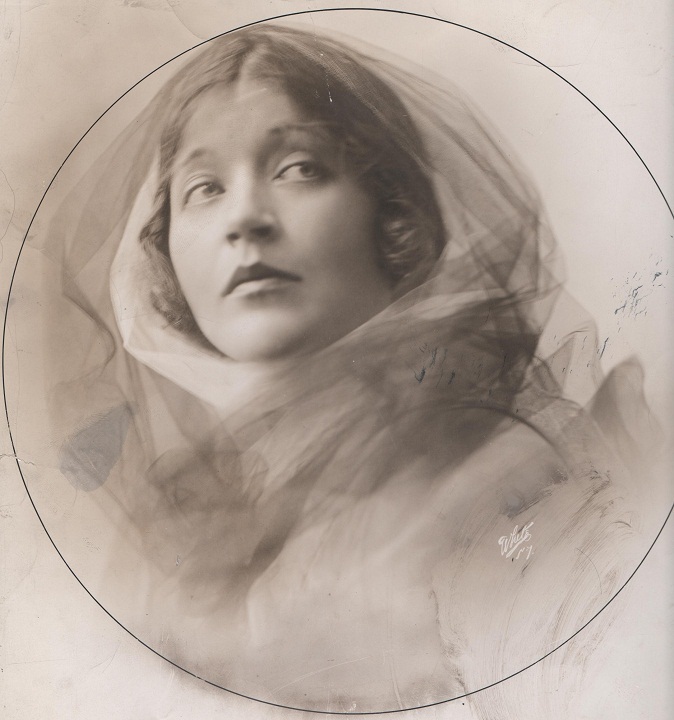 Below, an original White, New York, studio portrait of Mae Murray, from the same photo session as the one above, reprinted in the March 1916 issue of Photoplay Magazine. Mae Murray is almost universally thought to have given her best performance as an actress in The Merry Widow (MGM, 1925) under the direction of Erich von Stroheim. Oddly, it was my interest in Stroheim that led me to Murray. The descriptions of Murray by John Douglas Eames in his book, The MGM Story (Crown, 1979), in the late 70s, had me hooked. “[T]he picture [The Merry Widow] proved a tremendous success. Von Stroheim had drawn the best performance of her career from Miss Murray; her bizarre personality had never been so excitingly displayed. . . It was sad when [after Altars of Desire in 1927] her reign as one of the original queens of the MGM lot ended. You could call her affected, artificial, absurd; but who could deny that she was the very personification of Hollywood in its dizziest days of extravagance and glamour?” John Douglas Eames, The MGM Story. I wanted to learn more about this “bizarre” movie star who drove Stroheim into fits of anger to the extent that he walked off the set, ready to resign rather than continue with his film. In a future installment, I’ll explore this clash of great egos — the director and the star — that produced The Merry Widow, the film Mae Murray thought of as her best, despite the difficulties, and the role with which she most closely identified for the remainder of her life. Mae Murray original publicity photo for Ziegfeld’s Follies of 1915; “The Dream Waltz” and “Bonita Muchacha (Beautiful Girl)” song sheets, 1914; Mae Murray, c. 1914, White, NY, studio portrait; Original White, New York, studio portrait of Mae Murray, c. 1916.; and Mae Murray, circa 1908-09, publicity for Ziegfeld’s Follies of 1909; all from the author’s personal collection. 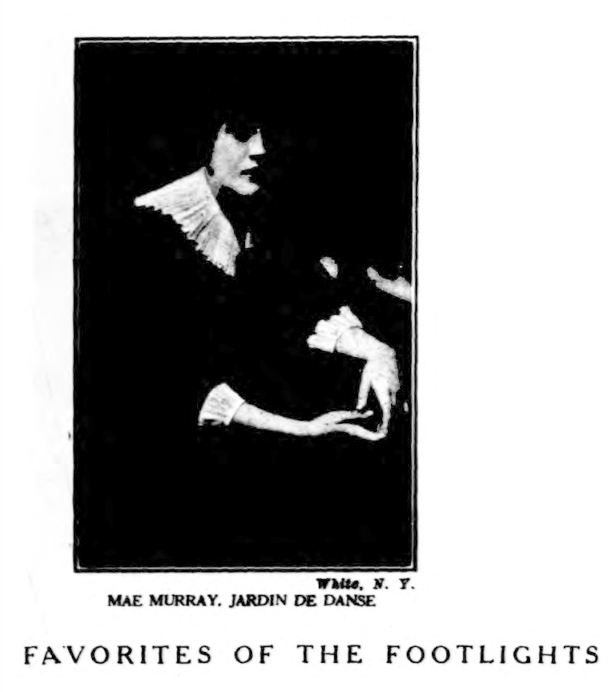 Mae Murray, “Favorites of the Footlights,” The New York Dramatic Mirror, Nov. 19, 1913, from The New York Dramatic Mirror Archive at http://www.fultonhistory.com/; Photoplay Magazine, March 1916 photo of Mae Murray, and July 1916 photo, “Once a Dancer,” from Media History Digital Library, at http://mediahistoryproject.org/.